For other uses, see Lufthansa (disambiguation). Deutsche Lufthansa AG (or JSC) (FWB: LHA) (German pronunciation: [ˌdɔʏtʃə ˈlʊfthanzaː]), commonly known as Lufthansa (sometimes also as Lufthansa German Airlines), is the largest German airline and, when combined with its subsidiaries, also the largest airline in Europe in terms of passengers carried. The name of the company is derived from the German word Luft "air" and Hansa, the Hanseatic League. Lufthansa is one of the five founding members of Star Alliance, the world's largest airline alliance, formed in 1997. Besides its own services, and owning subsidiary passenger airlines Austrian Airlines, Swiss International Air Lines, Brussels Airlines, and Eurowings including Germanwings (referred to in English by Lufthansa as its Passenger Airline Group), Deutsche Lufthansa AG owns several aviation-related companies, such as Lufthansa Technik and LSG Sky Chefs, as part of the Lufthansa Group. In total, the group has over 700 aircraft, making it one of the largest airline fleets in the world. 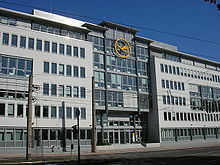 Lufthansa's registered office and corporate headquarters are in Cologne. 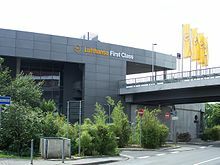 The main operations base, called Lufthansa Aviation Center, is at Lufthansa's primary hub at Frankfurt Airport, and its secondary hub is at Munich Airport where a secondary Flight Operations Center is maintained. Lufthansa's first aircraft, a Convair 340 (type pictured), was delivered in August 1954. Lufthansa traces its history to 1926 when Deutsche Luft Hansa A.G. (styled as Deutsche Lufthansa from 1933 onwards) was formed in Berlin. DLH, as it was known, was Germany's flag carrier until 1945 when all services were terminated following the defeat of Nazi Germany. In an effort to create a new national airline, a company called Aktiengesellschaft für Luftverkehrsbedarf (Luftag), was founded in Cologne on 6 January 1953, with many of its staff having worked for the pre-war Lufthansa. West Germany had not yet been granted sovereignty over its airspace, so it was not known when the new airline could become operational. Nevertheless, in 1953 Luftag placed orders for four Convair CV-340s and four Lockheed L-1049 Super Constellations and set up a maintenance base at Hamburg Airport. On 6 August 1954, Luftag acquired the name and logo of the liquidated Deutsche Lufthansa for DM 30,000 (equivalent to € 35000 today), thus continuing the tradition of a German flag carrier of that name. On 1 April 1955 Lufthansa won approval to start scheduled domestic flights, linking Hamburg, Düsseldorf, Frankfurt, Cologne, and Munich. International flights started on 15 May 1955, to London, Paris, and Madrid, followed by Super Constellation flights to New York City from 1 June of that year, and across the South Atlantic from August 1956. In August 1958 fifteen Lufthansa 1049Gs and 1649s left Germany each week to Canada and the United States, three 1049Gs a week flew to South America, three flew to Tehran and one to Baghdad. In parallel, the airline also initiated a marketing campaign to sell itself and West Germany. The challenges involved encouraging travelers to consider visiting the country in the wake of World War II, as well as offering services to other nations via the Frankfurt airport hub. More specifically, Lufthansa's efforts shaped and reflected the development of a modern form of consumerism and advertising through the sale of air travel. By 1963, the airline, initially limited in its public relations efforts, had become a major purveyor of West Germany's image abroad. The special status of Berlin meant that Lufthansa was not allowed to fly to either part of Berlin until 1989. Originally thought to be only a temporary matter (and with intentions to move the airline's headquarters and main base there once the political situation changed), the Division of Germany turned out to be long, which gradually led to Frankfurt Airport becoming Lufthansa's primary hub. East Germany tried to establish its own airline in 1955 using the Lufthansa name, but this resulted in a legal dispute with West Germany, where Lufthansa was operating. East Germany instead established Interflug as its national airline in 1963, which coincided with the East German Lufthansa being shut down. In 1960 Lufthansa joined the jet age with the Boeing 707. The image shows a 707 at Hamburg Airport in 1984, shortly before the type was retired. A Lufthansa Boeing 727–100 approaching London Heathrow Airport in 1978. In 1958 Lufthansa ordered four Boeing 707s and started jet flights from Frankfurt to New York City in March 1960. Boeing 720Bs were later bought to back up the 707 fleet. In February 1961 Far East routes were extended beyond Bangkok, Thailand, to Hong Kong and Tokyo. Lagos, Nigeria and Johannesburg, South Africa were added in 1962. Lufthansa introduced the Boeing 727 in 1964 and that May began the Polar route from Frankfurt to Tokyo via Anchorage. In February 1965 the company ordered twenty-one Boeing 737s that went into service in 1968. Lufthansa was the first customer for the Boeing 737 and was one of four buyers of the 737-100s (the others were NASA, Malaysia-Singapore Airlines, and Avianca – while the NASA airframe was the first built, it was the last delivered and originally intended for delivery to Lufthansa). Lufthansa was the first foreign launch customer for a Boeing airliner. The wide-body era for Lufthansa started with a Boeing 747 flight on April 26, 1970. It was followed by the introduction of the DC-10-30 on November 12, 1973, and the first Airbus A300 in 1976. In 1979 Lufthansa and Swissair were launch customers for the Airbus A310 with an order for twenty-five aircraft. The company's fleet modernisation programme for the 1990s began on June 29, 1985 with an order for fifteen Airbus A320s and seven Airbus A300-600s. Ten Boeing 737-300s were ordered a few days later. All were delivered between 1987 and 1992. Lufthansa also bought Airbus A321, Airbus A340, and Boeing 747-400 aircraft. In 1987 Lufthansa, together with Air France, Iberia, and Scandinavian Airlines, founded Amadeus, an IT company (also known as a GDS) that would enable travel agencies to sell the founders and other airlines' products from a single system. Lufthansa adopted a new corporate identity in 1988. The fleet was given a new livery, while cabins, city offices, and airport lounges were redesigned. The Boeing 737 is the best-selling jet airliner in the history of aviation. Lufthansa was the launch customer of the original 737-100 version. The image shows an aircraft of that type at Hannover Airport in 1968. Lufthansa operated the high-capacity Airbus A300-600 on domestic and European routes until 2009. The image shows an aircraft of that type on final approach at Frankfurt Airport in 2003. On October 28, 1990, 25 days after reunification, Berlin became a Lufthansa destination again. On May 18, 1997, Lufthansa, Air Canada, Scandinavian Airlines, Thai Airways International, and United Airlines formed Star Alliance, the world's first multilateral airline alliance. In 2000, Air One became a Lufthansa partner airline and nearly all Air One flights were code-shared with Lufthansa until Alitalia purchased Air One. Lufthansa has a good track record for posting profits, even in 2001, after 9/11, the airline suffered a significant loss in profits but still managed to stay 'in the black'. While many other airlines announced layoffs (typically 20% of their workforce), Lufthansa retained its current workforce. On December 6, 2001, Lufthansa announced an order for 15 Airbus A380 superjumbos with 10 more options, which was confirmed on December 20. The A380 fleet would be used for long-haul flights from Frankfurt exclusively. In June 2003, Lufthansa opened Terminal 2 at Munich's Franz Josef Strauß Airport to relieve its main hub, Frankfurt, which was suffering from capacity constraints. It is one of the first terminals in Europe partially owned by an airline. On May 17, 2004, Lufthansa became the launch customer for the Connexion by Boeing in-flight online connectivity service. In autumn 2003, the implementation of a new sales strategy initiated by then-incumbent Executive Vice President Thierry Antinori to make the company fit for the digital era led to the abolition of commission payments for travel agencies and led to a revolution in the German travel business with many travel agencies disappearing from the market on the one hand, and the rise of new digital distribution platforms on the other hand. On March 22, 2005, Swiss International Air Lines was purchased by Lufthansa's holding company. The acquisition included the provision that the majority shareholders (the Swiss government and large Swiss companies) be offered payment if Lufthansa's share price outperforms an airline index during the years following the merger. The two companies will continue to be run separately. On December 6, 2006, Lufthansa placed an order for 20 Boeing 747-8s, becoming the launch customer of the passenger model. The airline is also the second European airline to operate the Airbus A380 (after Air France). The first A380 was delivered on May 19, 2010, while the first 747-8 entered service in 2012. In September 2008, Lufthansa Group announced its intent to purchase a stake in Brussels Airlines (SN). In June 2009, the EU Commission granted regulatory approval and Lufthansa acquired 45% of SN. In September 2016, Lufthansa announced it would purchase the remainder of Brussels Airlines for €2.6 million euros. The transaction was completed in early January 2017. The decision was partially taken after the Brussels airport bombings of March 2016, which caused SN to lose almost €5 million euros per day until the 3rd of April. In September 2009, Lufthansa purchased Austrian Airlines with the approval of the European Commission. On June 11, 2010, Airbus A380 service between Frankfurt and Tokyo started. A Boeing 747-8I and Airbus A380 of Lufthansa at Frankfurt Airport. The A380 and 747-8, together with the recently introduced Airbus A350 XWB, form the backbone of Lufthansa's long haul routes. After a loss of 381 million euros in the first quarter of 2010 and another 13 million loss in the year 2011 due to the economic recession and restructuring costs, Deutsche Lufthansa AG cut 3,500 administrative positions or around 20 percent of the clerical total of 16,800. In 2012 Lufthansa announced a restructuring program called SCORE to improve its operating profit. As a part of the restructuring plan the company started to transfer all short-haul flights outside its hubs in Frankfurt, Munich and Düsseldorf to the company's re-branded low-cost carrier Germanwings. In September 2013 Lufthansa Group announced its biggest order, for 59 wide-body aircraft valued more than 14 billion euros at list prices. Earlier in the same year Lufthansa placed an order for 100 next-generation narrow-body aircraft. The group has had a long-standing dispute with the Vereinigung Cockpit union which has demanded a scheme in which pilots can retire at the age of 55 and 60% of their pay be retained, which Lufthansa insists is no longer affordable. Lufthansa pilots were joined by pilots from the group's budget carrier Germanwings to stage a nationwide strike in support of their demands in April 2014 which lasted 3 days. The pilots staged another 6 hours strike at the end of the Summer holidays in September 2014, which caused the cancellation of 200 Lufthansa flights and 100 Germanwings flights. In November 2014, Lufthansa signed an outsourcing deal worth $1.25 billion with IBM that will see the US company take over the airline's IT infrastructure services division and staff. In June 2015, Lufthansa announced plans to close its small long-haul base at Düsseldorf Airport for economic reasons by October 2015. At the time, the base consisted of two Airbus A340-300s rotating between Newark and Chicago. As a result, service to Chicago from Düsseldorf was first made seasonal, suspended for the winter 2015 season, and then cancelled altogether. Service to Newark, however, has been maintained. From the winter 2015 schedule through the end of the winter 2016 schedule, Düsseldorf was served by aircraft which also flew the Munich-Newark route. The Düsseldorf-Newark route ended on November 30, 2018 which was operated with an Airbus A330-300 aircraft. Their base was officially closed in March 2019. On 22 March 2016, Lufthansa ended Boeing 737-500 operations. The airline's last Boeing 737 (a 737-300) was retired on 29 October 2016, after a flight from Milan to Frankfurt. Lufthansa operated the 737 in several variants for almost 50 years, the first aircraft having been delivered on 27 December 1967. On 4 December 2017, Lufthansa became the first European airline to receive the prestigious Skytrax 5 star certification. This makes Lufthansa the 10th airline to be holding this award. In celebration, Lufthansa painted an Airbus A320 and a Boeing 747-8 in the "5 Starhansa" livery. In March 2018, Lufthansa and other airlines like British Airways and American Airlines accepted a request from Beijing to list Taiwan as part of China. In March 2019 Lufthansa ordered 20 Boeing 787-9 and additional 20 Airbus A350-900 for its own and the group's fleet replacement and expansion. Also, the airline announced it would sell six A380 aircraft back to Airbus, beginning in 2022. Lufthansa was a state-owned enterprise (and flag carrier) until 1994. Deutsche Lufthansa AG shares have been publicly traded on all German stock exchanges since 1966. In addition to floor trading, it is also traded electronically using the Xetra system. It is a DAX index share and is listed in the German Stock Exchange's Prime Standard. In its annual report for 2016, Lufthansa reported that German investors held 68.6 per cent of the shares (previous year: 74.9 per cent). The second largest group, with 13.4 per cent, were shareholders from the USA. Investors from Luxembourg accounted for 4.2 per cent, followed by the United Kingdom and Ireland, with 2.9 per cent and 1.8 per cent respectively. This ensures continued compliance with the provisions of the German Aviation Compliance Documentation Act (LuftNaSiG). 54.5 per cent (previous year: 53.9 per cent) of the shares were held by institutional investors and 45.5 per cent (previous year: 46.1 per cent) by private individuals. Lufthansa's corporate headquarters are in Cologne. In 1971, Lawrence Fellows of The New York Times described the then-new headquarters building that Lufthansa occupied in Cologne as "gleaming". In 1986, terrorists bombed the building. No one was injured. In 2006, builders laid the first stone of the new Lufthansa headquarters in Deutz, Cologne. By the end of 2007 Lufthansa planned to move 800 employees, including the company's finance department, to the new building. However, in early 2013 Lufthansa revealed plans to relocate its head office from Cologne to Frankfurt by 2017. Several Lufthansa departments are not at the headquarters; instead they are in the Lufthansa Aviation Center at Frankfurt Airport. These departments include Corporate Communications, Investor Relations, and Media Relations. Global Load Control, a world leader in remote weight and balance services. LSG Sky Chefs, the world's largest airline caterer, which accounts for one third of the world's airline meals. Lufthansa Consulting, an international aviation consultantancy for airlines, airports and related industries. Lufthansa Flight Training, a provider of flight crew training services to various airlines and the main training arm for the airline's own pilots. Lufthansa Systems, the largest European aviation IT provider. Lufthansa Technik, aircraft maintenance providers. A Lufthansa Airbus A320-200 wearing the new livery. The Lufthansa logo, an encircled stylized crane in flight, was first created in 1918 by Otto Firle. It was part of the livery of the first German airline, Deutsche Luft-Reederei (abbreviated DLR), which began air service on February 5, 1919. In 1926, Deutsche Luft Hansa adopted this symbol, and in 1954, Lufthansa expressed continuity by adopting it and later in 1963 — a variant thereof as redesigned by Robert Lisovskyi. The original creator of the name Lufthansa is believed to be F.A. Fischer von Puturzyn. In 1925, he published a book entitled "Luft-Hansa" which examined the options open to aviation policymakers at the time. Luft Hansa was the name given to the new airline, which resulted from the merger of Junkers' airline (Luftverkehr AG) and Deutscher Aero Lloyd. After World War II, the company kept blue and yellow as their main colours and the crane logo. Since the beginning of the 1960s, Helvetica was used for the company name in the livery. The fuselage was painted white on top, and was aluminium below a blue window band. The crane logo was painted blue on a yellow parabola inside a blue band on the tail. German designer Otl Aicher created a comprehensive corporate design for the airline in 1967. The crane logo was now always displayed in a circle which, on the livery, was yellow on an otherwise blue tailfin. Helvetica was used as the main typeface for both the livery and publications. The blue band and general paint scheme of the aircraft were retained from the previous livery. Aicher's concept remained in place until 2018, although the design was refreshed in 1988. The blue window band was removed and the bottom part of the fuselage and engines was now painted in light grey. Lufthansa bought a 19% stake in JetBlue Airways in December 2007 and entered a code-sharing agreement with the airline. It was the first major investment by a European carrier in an American carrier since the EU–U.S. Open Skies Agreement came into effect in 2008. Lufthansa sold its stake in JetBlue in March 2015. In late 2007, Lufthansa Cargo was forced to relocate a hub from Kazakhstan to Russia. On August 28, 2008, Lufthansa and Brussels Airlines announced that they were negotiating joining together. Lufthansa acquired a 45% stake in Brussels Airlines in 2009. It has an option to acquire the remaining 55% by 2017. As a part of the deal Brussels Airlines joined Star Alliance in December 2009. On October 28, 2008, Lufthansa exercised its option to purchase a further 60% share in BMI (in addition to the 20% Lufthansa already owned), this resulted in a dispute with former owner Sir Michael Bishop. Both parties reached an agreement at the end of June 2009, and the acquisition took place with effect from July 1, 2009. Lufthansa acquired the remaining 20% from Scandinavian Airlines on November 1, 2009, taking complete control of BMI. Lufthansa completed the purchase of Austrian Airlines from the Austrian government in January 2009. In 2010, Lufthansa was named in a European Commission investigation into price-fixing, but was not fined because it acted as a whistleblower. In April 2012, Lufthansa completed the sale of BMI to International Airlines Group (IAG), owner of British Airways and Iberia for £172.5 million. In July 2012, a Qantas–Lufthansa Technik maintenance deal for Tullamarine airport fell through due to having insufficient engine maintenance work to support the partnership. This resulted in 164 engineers being made redundant. This followed just months after the closing of heavy maintenance operations, which resulted in 400 additional job losses. It was announced that the Lufthansa Technik–Qantas partnership would end in September. Lufthansa also coordinates scheduling and ticket sales on transatlantic flights with Air Canada and United Airlines (as do Brussels Airlines, Swiss and Austrian Airlines). Lufthansa (with Swiss and Austrian Airlines) cooperates similarly with ANA on flights to Japan. Both ventures required approval of competition authorities. Until April 2009 Lufthansa inventory and departure control systems, based on Unisys were managed by LH Systems. Lufthansa reservations systems were outsourced to Amadeus in the early 1990s. Following a decision to outsource all components of the Passenger Service System, the functions were outsourced to the Altéa platform managed by Amadeus. Lufthansa describes Air Malta, Luxair, LATAM and bmi regional as partner airlines. The partnerships mainly involve code-sharing and recognition of each other's frequent flier programmes. Lufthansa sponsors Bundesliga club Eintracht Frankfurt. The Lufthansa Group also sponsors the German Sports Aid Foundation - promoting its sociopolitical goals and the athletes it sponsors. Airbus A320neo 19 96 — var — var 180 Worldwide launch customer with first delivery on 20 January 2016. Airbus A340-300 15 — — 42 28 181 251 To be replaced by Boeing 787-9. Airbus A340-600 17 — 8 44 32 213 297 To be replaced by Airbus A350-900. Boeing 747-400 13 — — 53 32 308 393 All to be retired by 2025. To be replaced by Boeing 777-9. Boeing 747-8 19 — 8 80 32 244 364 Largest operator of the 747-8I. Includes the 1500th Boeing 747 built. Boeing 777-9 — 20 TBA Deliveries from 2020. To replace Boeing 747-400 and 6 Airbus A380-800. Boeing 787-9 — 20 TBA Deliveries from 2022. Boeing 747-200F 1972 2005 Launch customer of the type. Freighter version of the 747-200B. In September 1960, a Lufthansa Boeing 707 (D-ABOC), which would serve the Frankfurt-New York intercontinental route, was christened Berlin after the divided city of Berlin by then-mayor Willy Brandt. 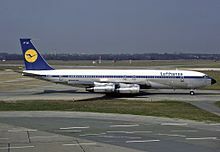 Following Berlin, other Lufthansa 707 planes were named "Hamburg", "Frankfurt", "München", and "Bonn." With these names, the company established a tradition of naming the planes in its fleet after German cities and towns or federal states, with a rule of thumb that the airplane make, size, or route would correspond roughly to the relative size or importance of the city or town it was named after. This tradition continued, with two notable exceptions, until 2010: The first was an Airbus A340-300 registered D-AIFC, named "Gander/Halifax", after Gander and Halifax, two Canadian cities along the standard flight path from Europe to North America. It became the first Lufthansa airplane named after a non-German city. The name commemorates the hospitality of the communities of Gander and Halifax, which served as improvised safe havens for the passengers and crew of the multitude of international aircraft unable to return to their originating airports during Operation Yellow Ribbon after the September 11, 2001 attacks. The other aircraft not named after a German city was an Airbus A321-100 registered as D-AIRA, which was designated Finkenwerder in honour of the Airbus facility in the district of Hamburg-Finkenwerder, where about 40% of Airbus narrowbody models are manufactured. In February 2010, Lufthansa announced that its first two Airbus A380s would be named Frankfurt am Main (D-AIMA) and München (D-AIMB) after Lufthansa's two hub airports. Subsequent A380 aircraft were named after other Lufthansa Group hub airports Zürich, Wien (Vienna) and Brüssel (Brussels) and the major German cities of Düsseldorf and Berlin. The remaining A380s were named after Star Alliance hub cities Tokyo, Beijing, Johannesburg, New York, San Francisco and Delhi. However, D-AIMN San Francisco was renamed Deutschland (Germany) in 2016. As of 2016 there are several short and long haul aircraft in Lufthansa's fleet that do not bear any name. They either never received one or their former one has been given to a newer aircraft, which was the case for several Boeing 747-400s. For example, the former Bayern (Bavaria), a Boeing 747-400 still in active service lost that name to a new Boeing 747-8. Lufthansa Technik, the airline's maintenance arm, restored a Junkers Ju 52/3m built in 1936 to airworthiness; this aircraft was in use on the 10-hour Berlin to Rome route, across the Alps, in the 1930s. Lufthansa is now restoring a Lockheed Super Constellation, using parts from three such aircraft bought at auctions. Lufthansa's Super Constellations and L1649 "Starliners" served routes such as Hamburg-Madrid-Dakar-Caracas-Santiago. Lufthansa Technik recruits retired employees and volunteers for skilled labour. Lufthansa had initially ordered a total of 15 Airbus A380-800, of which by June 2012 ten were delivered. In September 2011, the order was increased by two more copies to 17, this order was confirmed on March 14, 2013. However, in September 2013 it was announced that the Lufthansa Supervisory Board had approved the purchase of only twelve of the first 15 A380s. Thus, a total of 14 A380s have been added to the fleet. Lufthansa uses its A380s from and to Frankfurt am Main (9 aircraft) and since March 2018 to and from Munich as well (5 aircraft). From 6 to 12 December 2011, Lufthansa already used an A380 once a day on the route from Munich to New York-JFK. This happened mainly against the backdrop of Christmas shopping in New York City. On 13th March 2019, Lufthansa announced that it will be selling 6 A380 aircraft and replacing them with 20 Boeing 787-9 aircraft and 20 Airbus A350-900 aircraft. Lufthansa's frequent-flyer programme is called Miles & More, and is shared among several European airlines, including all of Lufthansa's subsidiary airlines (excluding the SunExpress joint ventures), plus Adria Airways, Condor Flugdienst (formerly owned by Lufthansa), Croatia Airlines, LOT Polish Airlines, and Luxair (stake formerly held by Lufthansa). Miles & More members may earn miles on Lufthansa flights and Star Alliance partner flights, as well as through Lufthansa credit cards, and purchases made through the Lufthansa shops. Status within Miles & More is determined by miles flown during one calendar year with specific partners. Membership levels include: Miles & More member (no minimal threshold), Frequent Traveller (Silver, 35,000-mile (56,000 km) threshold or 30 individual flights), Senator (Gold, 100,000-mile (160,000 km) threshold), and HON Circle (Black, 600,000-mile (970,000 km) threshold over two calendar years). All Miles & More status levels higher than Miles & More member offer lounge access and executive bonus miles, with the higher levels offering more exclusive benefits. First Class is offered on most long-haul aircraft (Airbus A330-300, A340-600, the front part of the upper deck of all Airbus A380s, and the main deck nose section of all Boeing 747–8s). Each seat converts to a 2 metres (6 ft 7 in) bed, includes laptop power outlets, as well as entertainment facilities. Meals are available on demand. Lufthansa offers dedicated First Class check-in counters at most airports, and offers dedicated First Class lounges in Frankfurt and Munich, as well as a dedicated first class terminal in Frankfurt. Arriving passengers have the option of using Lufthansa's First Class arrival facilities, as well as the new Welcome Lounge. Lufthansa has introduced a new First Class product aboard the Airbus A380 and plans to gradually introduce it on all of its long-haul aircraft. With the new programme SCORE, introduced to boost profits by 1.5 billion euros over the following years, LH will stop route expansion and extensively decrease its First Class offerings on most routes. Business Class is offered on all long-haul aircraft. Seats convert to 2 metres (6 ft 7 in) lie-flat beds and include laptop power outlets and entertainment facilities. Lufthansa offers dedicated Business Class check-in counters at all airports, as well as dedicated Business Class lounges at most airports, or contract lounges at other airports, as well as the Lufthansa Welcome Lounge upon arrival in Frankfurt. As of 2014, Business Class on all wide body aircraft feature flat bed seats. Lufthansa released plans for a new business class set to be released on the Boeing 777-9 in 2020. Introduced in 2014, Lufthansa's long-haul Premium Economy is being rolled out on all long-haul aircraft, starting with some Boeing 747-8s. Similar in design to Air Canada's Premium Economy or British Airways' World Traveller Plus cabins, Premium Economy features 38-inch (970 mm) pitch along with up to 3 inches (76 mm) more width than economy class, depending on the aircraft. The seats also feature a 11 or 12 inches (280 or 300 mm) personal seat-back entertainment screen and a larger armrest separating seats. Lufthansa's long-haul Economy Class is offered on all long-haul aircraft. All have a 31-inch (790 mm) seat pitch except the Airbus A380s, which have a 33-inch (840 mm) seat pitch. Passengers receive meals, as well as free drinks. The whole fleet offers Audio-Video-On-Demand (AVOD) screens in Economy Class. Lufthansa operates four types of lounges within its destination network: First Class, Senator, Business, and Welcome Lounges. Each departure lounge is accessible both through travel class, or Miles and More/Star Alliance status; the Welcome Lounge is limited to arriving premium passengers of the Lufthansa Group and United Airlines only. Lufthansa also operates a dedicated first class terminal at Frankfurt Airport. The first terminal of its kind, access is limited only to departing Lufthansa First Class, same day Lufthansa Group first class and HON Circle members. Approximately 200 staff care for approximately 300 passengers per day in the terminal, which features a full-service restaurant, full bar, cigar lounge, relaxation rooms, and offices, as well as bath facilities. Guests are driven directly to their departing flight by Mercedes-Benz S-Class, Porsche Cayenne, Porsche Panamera, or Mercedes-Benz V-Class. Lufthansa previously operated a check-in point in the city limits of Nuremberg and a bus service from Nuremberg to Munich Airport. This is a list of accidents and incidents involving Lufthansa mainline aircraft since 1956. For earlier occurrences, refer to Deutsche Luft Hansa. For accidents and incidents on Lufthansa-branded flights which were operated by other airlines, see the respective articles (Lufthansa CityLine, Lufthansa Cargo, Contact Air, Germanwings, and Air Dolomiti). On January 11, 1959, Lufthansa Flight 502, a Lufthansa Lockheed Super Constellation (registered D-ALAK) crashed onto a beach shortly off Galeão Airport in Rio de Janeiro following a scheduled passenger flight from Hamburg, Germany. Of the 29 passengers and 10 crew members on board, only the co-pilot and 2 flight attendants survived. Investigation into the accident resulted in blaming the pilots for having executed a too low approach, which may have been caused by fatigue. On December 4, 1961, a Lufthansa Boeing 720 (registered D-ABOK) crashed of unknown causes near Mainz during a training flight from Frankfurt to Cologne, killing the three occupants. It was the first crash involving an aircraft of that type. On July 15, 1964, another Boeing 720 (registered D-ABOP) crashed during a training flight, with the three people, including Werner Baake, on board losing their lives (in what was only the second crash for this aircraft type). The accident occurred near Ansbach after the pilots had lost control of the aircraft when executing an aileron roll. On January 28, 1966 at 17:50 local time, Lufthansa Flight 5 from Frankfurt to Bremen, which was operated using a Convair CV-440 Metropolitan registered D-ACAT, crashed 0.5 kilometres (0.31 mi) short of Bremen Airport, killing all 42 passengers and 4 crew members on board. The pilots had tried to execute a go-around when approaching the airport, during which the aircraft stalled and went out of control, possibly due to pilot error. D-ABYB, the aircraft destroyed in the Flight 540 accident, was the 2nd of 3 Boeing 747-100 delivered to Lufthansa. It is seen here during a promotional event at Nuremberg Airport in 1970. 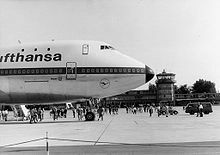 On November 20, 1974 at 07:54 local time, Lufthansa Flight 540, a Boeing 747–100 (registered D-ABYB), lost power and crashed shortly after take-off at Jomo Kenyatta International Airport in what was the first air accident involving a Boeing 747. 55 out of the 140 passengers and 4 out of the 17 crew lost their lives, making it the worst accident in the history of the airline. On July 26, 1979 at 21:32 UTC, a cargo-configured Boeing 707 (registered D-ABUY) that was en route Lufthansa Flight 527 from Rio de Janeiro to Dakar and onwards to Germany crashed into a mountain 25 kilometres (16 mi) from Galeão Airport during initial climb, killing the three crew members on board. A flawed communication between the pilots and the air traffic controller had resulted in the aircraft flying on a wrong path. On September 14, 1993, Lufthansa Flight 2904, an Airbus A320-200 (registered D-AIPN) flying from Frankfurt to Warsaw with 64 passengers and 4 crew members on board, overran the runway upon landing at Warsaw-Okecie Airport, and crashed into an earth embankment, resulting in the death of the co-pilot and one passenger. On December 20, 1973 at 00:33 local time, a Lufthansa Boeing 707 (registered D-ABOT) with 98 passengers and 11 crew members on board collided with a middle marker shack upon approaching Palam Airport in Delhi following a scheduled passenger flight from Bangkok (as part of a multi-leg flight back to Germany). There were no injuries, but the aircraft was damaged beyond repair. Visibility was poor at the time of the accident. On 18 October 1983, a Boeing 747-200 freighter ran off the runway at Kai Tak airport in Hong Kong and got bogged in the grass after an engine failure during take off. On 11 June 2018, one of the airline's Airbus A340-300s, registered as D-AIFA, was being towed to its departure gate at Frankfurt Airport when the towing vehicle caught fire. Despite the quick action of the airport fire brigade, the aircraft suffered substantial fire and smoke damage to the nose and flight deck. Six people were treated for smoke inhalation. On February 22, Flight 649, a Boeing 747-200 (registered D-ABYD) with 172 passengers and 15 crew members on board was hijacked en route from Delhi to Athens (as part of a multi-leg flight from Tokyo to Frankfurt) by five Palestinian terrorists who thus wanted to press a $5 million ransom from the German government. The aircraft landed at Aden International Airport, and the hostages were released on the following day once the demands of the perpetrators were accepted. On October 29, two men hijacked Flight 615 with 11 other passengers and 7 crew members on board during a flight from Beirut to Ankara (and onwards to Germany), in order to liberate the three surviving members of the Black September group responsible for the Munich massacre. Whilst the hijacked Boeing 727 (registered D-ABIG) was forced to circle over Zagreb Airport in danger of eventual fuel starvation, the West German authorities decided to comply with the demands. The prisoners were handed over and the aircraft was allowed to be flown to Tripoli, where the hostages were released. On December 17, 1973, in the wake of the events surrounding Pan Am Flight 110, a parked Lufthansa Boeing 737–100 (registered D-ABEY) was hijacked at Leonardo da Vinci-Fiumicino Airport in Rome. 10 Italian hostages that had been taken by Palestinian terrorists at the airport were forced into the aircraft by 5 perpetrators, and the German crew (2 pilots and 2 flight attendants) that was on board preparing the departure to Munich had to fly the aircraft instead first to Athens and then to several other airports, until the ordeal ended at Kuwait International Airport the next day, where the hijackers surrendered. The Hijacking of the Landshut occurred on October 13, 1977, at a time when West Germany had come under intense terroristic pressure known as German Autumn. The Boeing 737–200 (registered D-ABCE) was hijacked en route Flight 181 from Palma de Mallorca to Frankfurt by 4 terrorists of the Popular Front for the Liberation of Palestine, who thus wanted to force the German government to release several RAF terrorists. The crew had to divert the aircraft with 87 other passengers first to Rome, and then onwards to Larnaca, Bahrain, Dubai, Aden (where the captain was killed when he returned to the aircraft after negotiations with the local authorities), and finally to Mogadishu in an ordeal that took several days. At Mogadishu Airport, the German GSG 9 special forces stormed the aircraft in the early hours of October 18 local time, killing 3 terrorists and freeing all hostages. On February 11, 1993, Lufthansa Flight 592 from Frankfurt to Addis Ababa via Cairo with 94 passengers and 10 crew members was hijacked during the first leg by 20-year-old Nebiu Zewolde Demeke, who forced the pilots to divert the Airbus A310 (registered D-AIDM) to the United States, with the intent of securing the right of asylum there. Demeke, who had been on the flight in order to be deported back to his native Ethiopia, surrendered to authorities upon arrival at John F. Kennedy International Airport in New York City. No passengers or crew members were harmed during the 12-hour ordeal. Relations between Lufthansa and their pilots have been very tense in the past years, with many strikes occurring, causing many flights to be cancelled, as well as major losses to the company. A major dispute between Lufthansa and the pilot's union has been settled after nearly five years and overall 14 strikes in December 2017. Germanwings is a subsidiary of Lufthansa. Carsten Spohr, Lufthansa's CEO, oversaw the Germanwings Flight 9525 accident, "the darkest day for Lufthansa in its 60-year history". Nonetheless, damage control by Spohr and his team was poor according to several sources, as compared to other CEOs in the face of a major accident, with contradictory information given about the mental health and the airworthiness of the co-pilot Andreas Lubitz. It was revealed that Lubitz suffered from a severe case of depression and mental disorders and had intentionally crashed Germanwings Flight 9525 into the French Alps, killing all 150 aboard. Spohr had misleadingly said the co-pilot “was 100% airworthy without any restrictions, without any conditions”. On September 1, 2015, Lufthansa implemented a 16 euro surcharge on Global Distribution System bookings. The surcharge is payable unless tickets are purchased directly from the airline's website, or at its service centers and ticket counters at the airport. In a statement responding to Lufthansa's strategy, Amadeus said the new model would make “comparison and transparency more difficult because travelers will now be forced to go to multiple channels to search for the best fares. For the period between September 1–14, the airline experienced a 16.1% drop in revenue, indicating to some that the new fee backfired, although the airline maintains the statement that the decrease was due to the pilot strike, and "other seasonal effects". ^ a b "The Airline Codes Website". Retrieved 4 June 2015. ^ a b c d "We Call on Luftag". Flight International (5 February 1954): 165. Retrieved 19 April 2013. ^ a b c d Klussmann, Niels (2007). Lexikon der Luftfahrt. Heidelberg: Springer. pp. 396–397. ^ a b "As Time Flies By". Lufthansa. Retrieved 19 April 2013. ^ "Our hubs in Frankfurt, Munich, Dusseldorf, Zurich and Vienna". Lufthansa. Retrieved 1 February 2015. ^ "Lufthansa new CEO oversees network, airline brands". ^ , largest airlines in Europe , Lufthansa overtakes Ryanair in terms of passenger numbers in 2017. ^ "10 Lufthansa Facts You Should Know". Go Travel Your Way. 12 February 2016. Retrieved 20 February 2017. ^ "We hereby invite our shareholders to attend the 51st Annual General Meeting" (PDF). investor-relations.lufthansa.com. Archived from the original (PDF) on July 14, 2011. Retrieved August 25, 2009. ^ "How to get there". lac.lufthansa.com. Archived from the original on November 1, 2006. Retrieved July 30, 2002. ^ "Lufthansa opens new office complex in Frankfurt (Lufthansa eroffnet neue Konzernzentrale in Frankfurt)". Europe Intelligence Wire. July 19, 2006. Retrieved August 25, 2009. ^ a b c "A German Airline Again". Flight. 15 April 1955. pp. 472–473. Retrieved 9 July 2013. ^ "Die Tabellen-Piloten". Der Spiegel (22/1955): 32–40. 25 May 1955. Archived from the original on 26 October 2011. Retrieved 19 April 2013. ^ de Syon, Guillaume (2007). "7". In Swett, Pamela E (ed.). "Lufthansa Welcomes You: Air Transport and Tourism in the Adenauer Era". Duke University Press. ^ Kingsley-Jones, Max. "6,000 and counting for Boeing’s popular little twinjet." Flight International, Reed Business Information, April 22, 2009. Retrieved: April 22, 2009. ^ "Another airline enters the "A380 era" as Lufthansa receives its initial 21st century flagship aircraft". airbus.com. Retrieved November 24, 2010. ^ "History of Brussels Airlines". Retrieved August 13, 2013. ^ Hofmann, Kurt (15 December 2016). "Lufthansa acquires Brussels Airlines, to become part of Eurowings". atwonline.com. Retrieved 13 January 2017. ^ "Green Light for Merger of Austrian Airlines and Lufthansa | News". Breaking Travel News. Retrieved 2012-10-07. ^ COMKOM° GmbH, Germany. "Lufthansa A380 flights to Tokyo, Beijing and Johannesburg now bookable". Archived from the original on 2016-03-05. ^ Webb, Alex (May 3, 2012). "Lufthansa to Scrap 3,500 Administrative Posts After Loss". Bloomberg. ^ "Lufthansa on course with its SCORE programme". 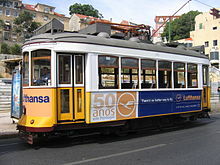 Lufthansagroup.com. Archived from the original on 2013-10-12. Retrieved 2013-10-11. ^ "Lufthansa Group orders 59 wide-body aircraft". Lufthansagroup.com. Archived from the original on 2013-10-12. Retrieved 2013-10-11. ^ "Lufthansa pilots' strike causes cancellation of more than 200 flights". Travel Trade.Org. 6 September 2014. Retrieved 7 September 2014. ^ "Lufthansa signs $1.25 billion outsourcing deal with IBM" (Press release). Reuters. 18 November 2014. ^ "Lufthansa is the only five-star airline in Europe". Lufthansa Group | Newsroom. 2017-12-04. Retrieved 2017-12-20. ^ "5 Starhansa | World Airline News". worldairlinenews.com. Retrieved 2017-12-20. ^ Blüthmann, Heinz (13 May 1994). "Neue Freiheit". Die Zeit (in German). Archived from the original on 21 October 2013. Retrieved 21 October 2013. ^ "." Lufthansa. Retrieved on 1 January 2016. ^ a b "Lufthansa Group: Annual Report 2016" (PDF). Lufthansa. Retrieved 7 July 2017. ^ a b c d e f g h i j k l m "Lufthansa Annual Reports". Lufthansa. Retrieved 7 July 2017. ^ Fellows, Lawrence. "Germans Setting Own Office Hours; Some German Workers Set Their Own Hours -Within Reason." The New York Times. Monday July 12, 1971. Page 1. Retrieved on February 14, 2010. "At Lufthansa's gleaming new office building here, and at many other offices and factories around West Germany, men and women now go to work when they want and stay as long as they want – within reason." ^ "Terrorists Shoot Berlin Official, Bomb Airline". Los Angeles Times. October 28, 1986. p. Section 1, Late Final Desk. Start Page 2. Retrieved February 14, 2010. ^ "Around the World; Bomb Rips Offices Of Lufthansa in Cologne". Associated Press at The New York Times. October 29, 1986. Retrieved November 24, 2010. ^ "Grundsteinlegung für Lufthansa Hauptverwaltung in Köln." KFZ.net. Retrieved on February 12, 2010. "Die Lufthansa hat mit einer Grundsteinlegung in Köln-Deutz den Beginn der Arbeiten für ihre neue Kölner Konzernzentrale gefeiert. Ende 2007 werden rund 800 Kölner Lufthanseaten, vor allem aus dem Konzernressort Finanzen, das Hochhaus am Rhein verlassen und in den nur wenige hundert Meter entfernten Neubau umziehen, erklärte das Unternehmen." ^ Hofmann, Kurt. "Lufthansa deepens cuts." Air Transport World. 20.2.2013. Retrieved on 15 November 2013. ^ "Contacts Investor Relations Archived 2011-07-14 at the Wayback Machine." Lufthansa. Retrieved on February 14, 2010. ^ "Media Relations Archived 2011-06-20 at the Wayback Machine." Lufthansa. Retrieved on February 14, 2010. ^ a b "Lufthansa Annual Report 2012" (PDF). Retrieved March 30, 2013. ^ Lufthansa Chronicle. Konzern.lufthansa.com (June 28, 2011). Retrieved on July 8, 2011. ^ staralliance.com Archived 2009-12-15 at the Wayback Machine. staralliance.com. Retrieved on July 8, 2011. ^ "Lufthansa Strikes BMI Deal, Ending Dispute". Dow Jones Deutschland. July 22, 2009. Archived from the original on July 27, 2011. Retrieved November 24, 2010. ^ "Lufthansa to gain full control of bmi from SAS, while BA confirms interest in the UK carrier". Centre for Asia Pacific Aviation. October 2, 2009. ^ "Eleven airlines fined in European cargo cartel investigation". Retrieved November 10, 2010. ^ "Job Losses After Qantas-Lufthansa Deal Falls Through". Airport International. July 26, 2012. Archived from the original on 2012-07-28. Retrieved 2012-07-27. ^ "German giants sign Samsung extension". ^ "Commitment to Sports". Archived from the original on 16 April 2015. Retrieved 10 April 2015. ^ "Profile on Lufthansa". CAPA. Centre for Aviation. Archived from the original on 2016-10-30. Retrieved 2016-10-30. ^ "Air Astana and Lufthansa Sign Codeshare Agreement | AviationPros.com". AviationPros.com. 15 March 2017. Retrieved 16 March 2017. ^ Liu, Jim (20 March 2018). "ANA extends Lufthansa codeshares to the Baltics in S18". Routesonline. Retrieved 20 March 2018. ^ Liu, Jim (22 March 2018). "Lufthansa expands Austrian codeshare to Ukraine from March 2018". Routesonline. Retrieved 22 March 2018. ^ "Etihad and Lufthansa strike code-share deal - The National". ^ planespotters.net. "Lufthansa fleet list". Retrieved 1 November 2017. ^ "A320 Seat Map" (PDF). ^ "A32V Seat Map" (PDF). ^ "A320neo Seat Map" (PDF). ^ "A321 Seat Map" (PDF). ^ "Lufthansa Group Fleet: A340-600". ^ "Lufthansa begins A340-600 phase out". ch-aviation. Retrieved 2017-04-07. ^ 19 September 2013. "Lufthansa, Airbus' biggest airline customer, commits to up to 55 A350s | Airbus News & Events". Airbus.com. Retrieved 2013-09-19. ^ 19 September 2013 (September 19, 2013). "Lufthansa confirms huge Airbus, Boeing jet order". Reuters.com. Retrieved 2013-09-19. ^ "Lufthansa orders 40 787s and A350s but cuts A380 fleet". FlightGlobal. 13 March 2019. ^ "Lufthansa seeks to boost Boeing fleet size to 35% | DUBAI AIRSHOW 2017". www.dubaiairshow.aero. Retrieved 2017-09-14. ^ Michaels, Daniel (16 June 2008). "WSJ's Dan Michaels reports how German carrier Lufthansa refurbished a 1936 Junkers 52/3m". The Wall Street Journal. Retrieved 27 August 2013. ^ Michaels, Daniel (16 June 2008). "Engineering Veteran Plays a Vital Role In Plane's Rebirth". The Wall Street Journal. Retrieved 27 August 2013. ^ a b "Miles & More status levels". Miles-and-more.com. Archived from the original on 2013-10-12. Retrieved 2013-10-11. ^ "Lufthansa First Class". a380.lufthansa.com. Retrieved November 24, 2010. ^ Richard Weiss (2013-02-21). "Lufthansa to Shrink First-Class Fleet Below British Airways". bloomberg.com. Retrieved 2013-08-18. ^ Snyder, Brett. "Photos: Inside Lufthansa's New Business Class". Conde Nast Traveler. Retrieved 12 October 2014. ^ "Lufthansa unveils new fully-flat business class seat". Business Traveler. 2012-03-08. Retrieved May 20, 2012. ^ COMKOM° GmbH, Germany. "World premiere: Lufthansa presents Premium Economy Class". Archived from the original on 2014-03-07. ^ Lounge types and access Lufthansa. ^ "New: Lufthansa Airport Bus Nuremberg - Munich". Lufthansa. 1996-11-09. Archived from the original on 1996-11-09. Retrieved 2018-07-26. ^ Lufthansa 1959 crash at the Aviation Safety Network. Aviation-safety.net. Retrieved on July 8, 2011. ^ Lufthansa 1961 accidents at the Aviation Safety Network. Aviation-safety.net (December 4, 1961). Retrieved on July 8, 2011. ^ Lufthansa Flight 5 at the Aviation Safety Network. Aviation-safety.net (January 28, 1966). Retrieved on July 8, 2011. ^ "Lufthansa Fleet Details and History". Archived from the original on 2014-08-19. ^ Flight 540 at the Aviation Safety Network. Aviation-safety.net. Retrieved on July 8, 2011. ^ Flight 527 at the Aviation Safety Network. Aviation-safety.net. Retrieved on July 8, 2011. ^ Flight 2904 at the Aviation Safety Network. Aviation-safety.net (September 14, 1993). Retrieved on July 8, 2011. ^ 1973 incident at the Aviation Safety Network. Aviation-safety.net (December 20, 1973). Retrieved on July 8, 2011. ^ "ASN Aircraft accident Boeing 747-230F D-ABYU Hong Kong-Kai Tak International Airport (HKG)". Aviation Safety Network. ^ Eiselen, Stefan (11 June 2018). "Airbus A340 von Lufthansa bei Brand beschädigt". Aero Telegraph. ^ February 1972 hijacking at the Aviation Safety Network. Aviation-safety.net. Retrieved on July 8, 2011. ^ "On This Day—23 February1972: Hijackers surrender and free Lufthansa crew". BBC. February 23, 1972. Retrieved 29 August 2013. ^ July 1972 hijacking at the Aviation Safety Network. Aviation-safety.net (July 10, 1972). Retrieved on July 8, 2011. ^ October 1972 hijacking at the Aviation Safety Network. Aviation-safety.net (October 11, 1972). Retrieved on July 8, 2011. ^ 29 October 1972 hijacking at the Aviation Safety Network. Aviation-safety.net. Retrieved on July 8, 2011. ^ Peter Chalk (2012). Encyclopedia of Terrorism. ABC-CLIO. Retrieved February 28, 2013. ^ Sattar, Majid (9 November 2006). "Folgen eines Anschlags" (in German). Frankfurter Allgemeine Zeitung. Retrieved 26 July 2013. ^ 1973 hijacking at the Aviation Safety Network. Aviation-safety.net. Retrieved on July 8, 2011. ^ Arab Hijackers Land in Kuwait; Hostages Freed," The New York Times, December 19, 1973. Page 1. ^ June 1977 hijacking at the Aviation Safety Network. Aviation-safety.net (June 28, 1977). Retrieved on July 8, 2011. ^ Flight 181 at the Aviation Safety Network. Aviation-safety.net. Retrieved on July 8, 2011. ^ 1979 hijacking attempt at the Aviation Safety Network. Aviation-safety.net (September 12, 1979). Retrieved on July 8, 2011. ^ February 1985 hijacking at the Aviation Safety Network. Aviation-safety.net (February 27, 1985). Retrieved on July 8, 2011. ^ March 1985 hijacking at the Aviation Safety Network. Aviation-safety.net (March 27, 1985). Retrieved on July 8, 2011. ^ March 1985 hijacking attempt at the Aviation Safety Network. Aviation-safety.net (March 29, 1985). Retrieved on July 8, 2011. ^ Flight 595 at the Aviation Safety Network. Aviation-safety.net. Retrieved on July 8, 2011. ^ ksb/bk. (2015). "No sign of take off as Lufthansa pilots extend strike to three days". Deutsche Welle, Bonn. ^ "Lufthansa und Piloten: Die Streikhansa ist gelandet". ^ "Lufthansa boss says past hours 'darkest in 60-year history'". ITV News. 25 March 2015. Retrieved 25 March 2015. ^ "Lufthansa Chief Carsten Spohr Under Spotlight After Germanwings Crash". The Wall Street Journal. 1 April 2015. Retrieved 8 May 2015. ^ "Lufthansa to charge fee for GDS Bookings". Oct 24, 2015. ^ "Lufthansa disputes report that says GDS bookins are way down". Oct 24, 2015. ^ The company that today is known as Deutsche Lufthansa AG was founded as Aktiengesellschaft für Luftverkehrsbedarf (Luftag) on 6 January 1953. It sees itself in the tradition of Deutsche Lufthansa, the former German national airline that was founded in 1926 and liquidated in 1951, whose name and logo it acquired in 1954. Lufthansa frequently names "1926" as its founding date, but it is not the legal successor of the earlier airline. ^ Lufthansa also counts Düsseldorf Airport, Vienna International Airport and Zürich Airport as its hubs. They are not listed here because they are home to Lufthansa's subsidiaries Eurowings, Germanwings, Austrian Airlines, Brussels Airlines, and Swiss International Air Lines, respectively. For the same reason, all other Eurowings and Germanwings bases are omitted.